You would think after nearly five years of hanging out with the flyboy, I’d have wised up to a few things. If there is one thing I know, he loves a good surprise. Correction, he likes a surprise when he is on the delivery end of it. That being said, I should have come to expect such surprises, and consequently not be so surprised. Apparently, I am slow learner. As I mentioned earlier, the flyboy and I are planning a wedding. Not to point fingers, but he might drag his feet a bit on making commitments like booking a wedding venue, and I may rag on him just a bit in return. Sunday morning I cornered him, and with great seriousness, informed him that we would be booking the farm as a venue by the end of the day. He smiled and nodded his agreement. * The day rolled on by and during dinner, I reiterated the necessity to book by that evening. He offered to finish the dishes so I could get online to make the reservation. ** “No, no,” I said, insisting on helping finish the cleanup. It was pushing up against 8pm when I pulled up the Feather Down Farms page and looked at their reservation calendar. Scanning for the dates we wanted, to my shock and horror, I found that the only two days already reserved for all of June, July, and August were the two that I wanted. Three months, entirely wide open EXCEPT for the two days I wanted? How was this happening? There must be some mistake! At which point, I look over to Nate and with great disappointment on my face, tell him I’ll call the farm in the morning and find out what’s going on and he’s smiling and nodding… Smiling? Wait a second. The scoundrel himself has taken the initiative and already booked it, and sat reveling in my growing panic attack and nearly bride-zilla moment. I wanted to throttle and kiss him, all at the same time. To top it off, a day later, in grand romantic Valentine’s day gesture, the flyboy swept me off my feet with the gift of dirt. That’s right. 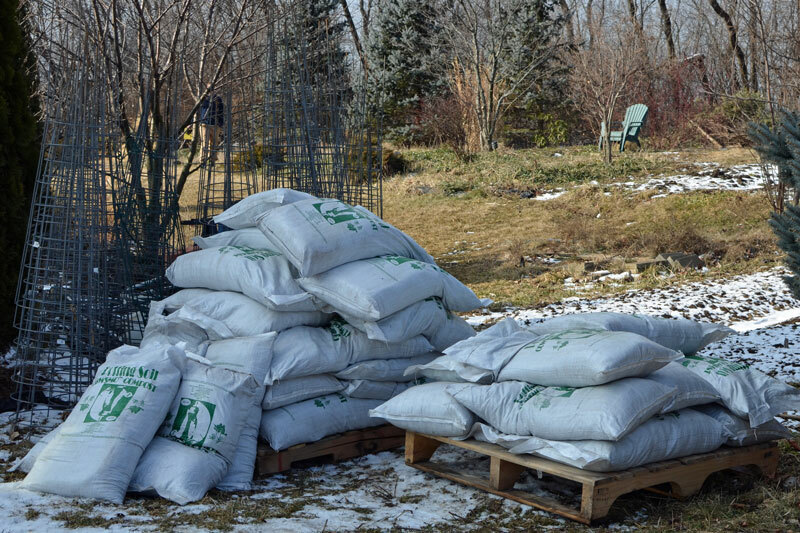 Forty bags of organic potting soil straight from Wisconsin. I didn’t see that one coming either. It was delivered this morning and we shlepped it out of the delivery van and onto pallets. Nate predicts we will use all of the 2000 pounds of old decomposed poo this season, and I think he might have overestimated. As soon as next week, we will start to start the starts! There are still plans afoot for putting up a hoop house this spring that would ideally mean my starts could be in their own little spot, rather than on a table in the middle of our bedroom. We have not yet ironed out details like the size, who to order from, kit or no kit, but I have already started recruiting unsuspecting friends for the hoop house raising. In other Fox Plot news, my fig trees that hang out in the garage over the winter began to bud out a couple weeks ago. The garage gets surprisingly warm but very little light, so the leaves are a pale version of their usual selves, but there are figs! I need to do a bit more research, because as much as I like my fig trees, I don’t know how best to care for them. I worry about them much less than my bees, who I also visited today. No news is good news, or so they say. I peeked in just a tiny bit and there’s little change in the hives, as they have not eaten any noticeable amount of the bee food I put in last week. At least they are still hanging out inside their hive, huddled as close as they can. I have two new hives on order, with high hopes of keeping four this summer. However, if the worst happens and I lose one or both of these in early spring, I will be, at minimum, able to replace them, though a sad day that would be (no pun intended!). And that’s the latest from the Fox Plot. *The first hint I missed. ** Don’t even asked me why this didn’t raise suspicion. I have no idea. What a romantic gesture. SO looking forward to this wedding, by the way! 🙂 Oh so Nate, right? And me too! Send me your ideas of dresses, the shopping starts soon!